The yellow lead has a ground that is permanently attached. For the other leads, use the long ground extensions included with the set. As long as the leads, amp probes, ignition leads use banana plugs to connect to the Snap-on scope, you can use the AES Flexible Adapter -- Male BNC to Banana Sockets (AES# 08-88-M) to connect them to your Snap-on scope. 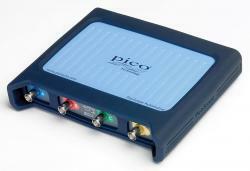 The Pico requires each channel to be grounded. Can each of the Snap-on leads make a ground connection at the car? Snap-on's ignition leads have a unique input impedance, works great with Snap-on scopes, but not as well on other scopes. For the amp probes, you can create a "custom probe" to accomodate any differences in scaling if Pico's built-in custom probes don't match. Yes, the leads for my Verus i got through you guys. There the extra long test drive leads, they can be grounded. I could use the ground stacker on my test leads right. And for the ignition probe, i also have probes i have got from you guys like the paddle probe.